Supports network hardware protocols such as Allen Bradley’s DataHighway Plus/Remote I/O, Profibus, Devicenet and Modbus Ports. The new UT Windows HMI combines the easy to use uWin software known for its reliability and universal connectivity to all PLCs, with a powerful Windows 7 Fanless Industrial Panel Computer. The new Uticor UT Windows HMI, equipped with an Intel Atom E640 1 GHz processor with 1GB DDR RAM, takes Panel PCs to a new level. Available in both 10” and 15” models, the UT Windows HMI comes standard with 4GB of SSD Memory, 4 USB ports, a MicroSD card reader, 2 Serial Ports, and a 1GB Ethernet Port. 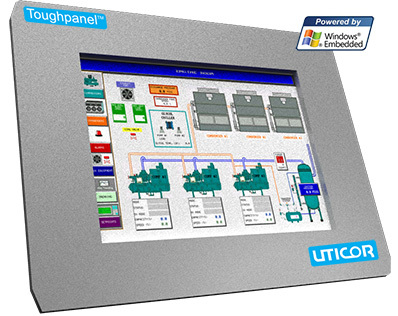 With an all-in-one package, the UT Panel PC HMI™ can be used as an Industrial PC, an HMI, or a complete SCADA system. Uticor’s UT PanelPC HMI™ is fanless and designed for industrial environments with a Nema 4/4X rated housing. The USB ports and MicroSD card reader offer virtually limitless memory as well as universal connectivity to the peripherals of your choice such as Printers, Bar-Code Scanners, Weigh Scales, Cameras, etc. The UT Windows HMI is scalable and adjustable to any size window to allow for multi-tasking with other software packages. The ability to install any software package of your choice allows you to develop, monitor and adjust your HMI or PLC programming directly on the screen without interrupting HMI operations. In addition to traditional Serial and Ethernet communication protocols, Uticor's UT Windows HMI also offers various Network hardware protocols such as Allen Bradley’s DataHighway Plus/Remote I/O, Profibus, Devicenet and Modbus Plus.